I can't help myself. I just wanted to update you on two unusual developments. 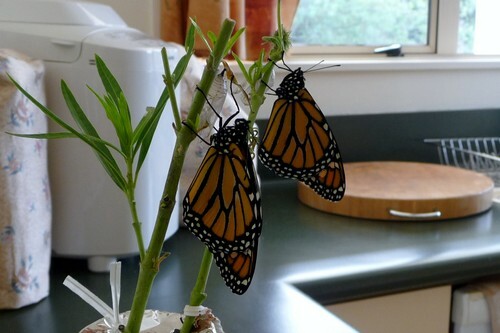 One is how two butterflies have taken to a Swan Plant and are staying put. We had some windy, wet weather and they didn't have much protection, yet they hung on. I would look out of the window and see them getting buffeted but they took it all. They reminded me of children who have grown up but don't want to leave home. The other is about a wire we had used for runner beans. When the bean foliage was stripped off the wire, it came lose and needed refastening. 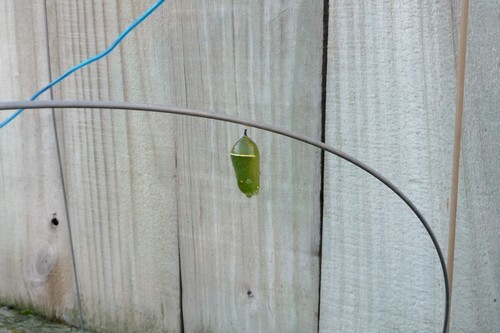 When we went to do that, a chrysalis appeared attached to the wire. 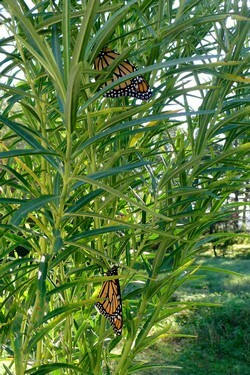 We have left things alone and will have to wait for it to turn into a Monarch Butterfly. It either crawled along from the Swan Pant about four metres away or was transferred on some foliage when things were being tidied up for winter. For the next in the series, just click here. PS. #8 came on the 25.05 & #9 the 27.05.16.